I made this for myself. I should have checked the nexus first, you know there is bound to be another person that has a similar idea. Well there was. Wolfram's mod uses the third person mesh, so both mods look slightly different. 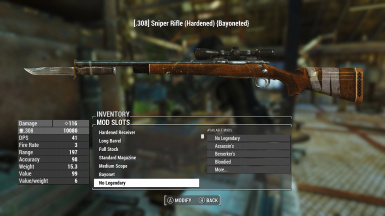 To go the extra mile, try add locking lugs to the rifle that Bethesda clearly forgot is a must when it comes to locking the bayonet in place. Yeah it's to bad they are held back by weak consoles, just think of the detail they could accomplish on good hardware. If I had the modeling software I could add that, but I don't and this is the best I could do with what I have. Look good. Its the kind of mods you don't know you needed until someone does it. 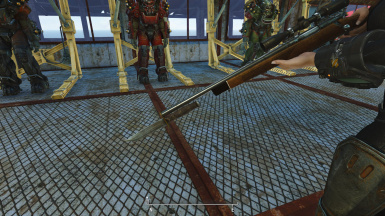 are the rifle texture Vanilla ? Such a small adjustment, yet so incredibly useful. FO4's iffy approach to bayonets generally leads to me foregoing them altogether, but this one is nice enough that I'd actually use it. Have you considered correcting some of the other bayonets? Yes, I have another mod I will be releasing shortly that adds bayonets without handles. Its a new category for short barrels so there wont be mesh clipping.